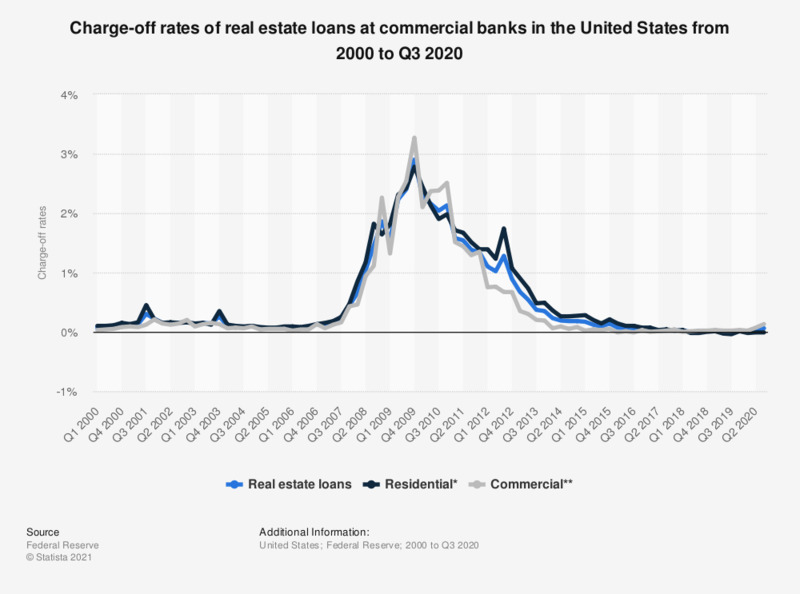 This statistic presents the charge-off rates on real estate loans at insured commercial banks in the United States from 2000 to 2017, providing a further breakdown of residential and commercial loans. In 2017, the charge-off rate on residential real estate loans at insured commercial banks in the United States stood at 0.04 percent. * Residential real estate loans include loans secured by one- to four-family properties, including home equity lines of credit, booked in domestic offices, only. Charge-offs, which are the value of loans removed from the books and charged against loss reserves, are measured net of recoveries as a percentage of average loans and annualized. Includes only U.S.-chartered commercial banks.